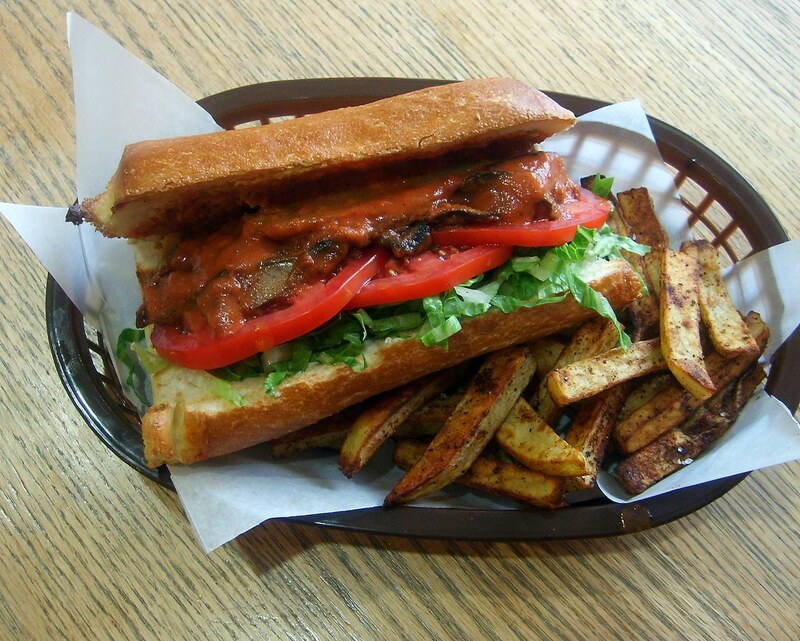 I've always wanted to go to New Orleans--I just love Cajun and Creole cuisine, especially the Po' Boy sandwich, stuffed with delicious ingredients and dripping with a spicy Creole sauce! The history behind the Po' Boy is quite interesting. It started in 1929 in New Orleans when the streetcar motor workers and conductors went on strike after failed negotiations. Two brothers, Bernie and Clovis Martin, who owned a coffee stand and restaurant in the French market, promised to support the striking workers. And they did this by providing large sandwiches 15-20", free of charge, everyday to the workers until the strike ended. Whenever they would see one of the strikers walking towards them, they said, "here comes another Poor Boy", and so the Po' Boy sandwich was appropriately named. By the start of the Great Depression, the workers had lost the strike, along with their jobs, but the Martin's continued to support the unemployed men. This turned out to be a wise business decision because in the end, they gained hundreds of new customers who fell in love with the Po' Boy sandwich and still love it to this day! For my Po' Boy, I decided to use Portobello mushrooms. I've also made it before using Soy Curls, Seitan and Tempeh and all have turned out equally delicious. Since portobello's can be found in any market it is one less special ingredient to purchase. Combine all ingredients, except the canola oil and salt, in a food processor or blender and blend until smooth. With the motor running, drizzle in canola oil until emulsified and creamy. Check for seasoning and add salt if necessary, blend again and set aside. 4 large portobello mushrooms, stems and gills removed, sliced in half and then sliced into 1/8"-1/4" thick strips. Note: Allow 1 large portobello per person. In a large frying pan over medium heat, add canola oil and sliced mushrooms. Cook until mushrooms have released their moisture and are slightly browned. Add 1/2 of the creole sauce and heat through. Turn heat to low. Heat the remaining creole sauce separately and set aside. While mushrooms are cooking prepare the other ingredients. Slice rolls and heat in the oven until lightly browned and slightly crunchy. Smear the bottom side of the roll with vegenaise and top with shredded lettuce or cabbage and tomatoes. Smear the top side of the roll with Creole mustard and sliced pickles. Add three large heaping tablespoons of the Creole mushroom mixture and pour over additional sauce. Serve with oven-baked Cajun fries, extra pickles and vegan tartar sauce. 4 large russet potatoes, washed, peeled and sliced into 1/4" thick slices. In a large bowl, toss potato slices with canola oil and Old Bay seasoning, sea salt and black pepper. Place potatoes on two sheet trays and spread out so that they cook evenly. Bake for 10 minutes, flip potatoes with a spatula and continue cooking for another 10 minutes until crispy and golden brown. Sprinkle with course sea salt or kosher salt just before serving. Serve immediately with either vegan tartar sauce or ketchup for dipping.